Many organisations today are establishing an Enterprise Architecture (EA) business function. However the knowledge about enterprise architecture concepts, framework and processes within many organisations is still quite limited and at a low level of maturity. Very often there is a good understanding of the technology and infrastructure architecture and the to a lesser extent of the application architecture but far less understanding of the enterprise architecture discipline. 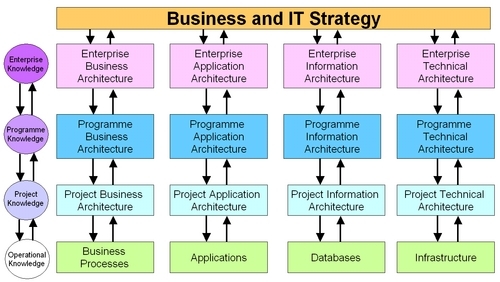 The concept of enterprise architecture has evolved considerably from John Zachman’s original work in the 1980’s on his Framework for Information Systems Architecture. The Zachman Framework has provided the basis for many more recent enterprise architecture frameworks and associated processes that are now available. According to many surveys, the majority of organisations usually choose to create their own EA framework rather than adopt any existing one. The reasons for this vary, from the requirement to support a service oriented architecture, object orientation and component based development viewpoints, to a simple desire to use a different terminology that is tailored to the language used within the organisation. The purpose of this EA Wiki is to provide organisations with a common reference for the main Enterprise Architecture concepts, frameworks, processes and best practices that can be used today to create a tailored enterprise architecture. The approach taken by this EA Wiki draws on many existing EA resources that can be found today. It is based primarily on a combination of existing best practices for enterprise architecture: Archimate, COBIT, TOGAF, FEAF, SOA, ITIL, XGEA, Zachman, EBA and Information First.